Has Sexism Become A Barrier To A Brexit Breakthrough? March 31, 2019  This week, the British parliament once again rejected a plan by Prime Minister Theresa May's to leave the European Union. NPR's Korva Coleman speaks with Hannah Peaker, a leader of the Women's Equality party, about May's leadership and her critics. March 31, 2019  NPR's Lulu Garcia-Navarro asks José Díaz-Briseño, Washington correspondent for the Mexican newspaper Reforma, how Mexico has been reacting to the latest escalation in rhetoric from President Trump. 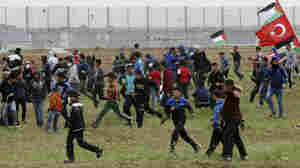 March 31, 2019  On the first anniversary of major protests at the border fence between Israel and Gaza, demonstrations were calmer than usual, but four Palestinians were killed. March 30, 2019  The Syrian government has declared victory over ISIS — years after the same was said of Iraq. NPR's Korva Coleman speaks with Yale researcher Mara Redlich Revkin about life after ISIS in Iraq. March 30, 2019  The airline Garuda Indonesia wants to cancel its order of 49 Boeing 737 Max 8 planes, but contracts make it expensive to do so. March 30, 2019  NPR's Scott Simon talks with Sen. Bob Menendez, D-N.J., about the situation in Venezuela and the end of the Mueller investigation.